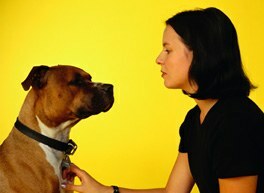 For many years, dominance theory and the alpha dog concept has been used to explain dog behaviour. This theory basically says that dogs have a very linear pack structure, with the alpha dog, or pack leader, at the top of the hierarchy and all other pack members below them, like rungs on a ladder. Each dog's behaviour, particularly any aggressive behaviour, can be explained by their efforts to move higher on the ladder, and push other dogs into a lower, subordinate position. Dogs that have a higher position in the pack eat before lower pack members, and are more likely to breed. Followers of the alpha dog concept believe that you need to be the pack leader, or alpha dog, in your home because if you don't, your dog will. This will result in your dog not doing as he is told, and perhaps even growling at you when you ask him to do something. The source of the alpha dog theory came from observing captive wolf packs – individual wolves were taken from a number of zoos and combined to form a new wolf pack. These wolves were adults, and certainly had to stand up for themselves amongst the others, and they developed a hierarchal structure to allow them to live in harmony. It is a totally artificial way of housing wolves, and doesn't demonstrate natural wolf behaviour. Alpha dog behaviours don't occur in a wild wolf pack, because there isn't usually a specific alpha wolf. There is no aggression between adult pairs, and when the youngsters are old enough to want to take charge, they move off to establish their own family group. Captive wolf packs don't have the ability to move away, so they have to stay where they are, bickering and squabbling for position. There are many things wrong with this concept when it is applied to our pet dogs. We can't compare domestic dogs who evolved as scavengers, with wolves who were hunters and predators, and even less so with captive wolves living in artificial packs in un-natural environments. Unfortunately, some people believe that to effectively be their dog's master, they have to demonstrate their dominance with techniques such as the “alpha roll” - forcing their dog into a subordinate position on their back. The dominance/alpha dog theory of dog behaviour usually results in coercive training methods, and are often based on punishment. It does nothing to build a rapport and partnership between dog and owner, and can in fact permanently damage their relationship. Does this mean that dogs don't use dominance in their interactions with each other? Not at all. Dogs, like people, have different personalities, and some are more assertive than others. Dominance can be used to describe the interaction between two individual dogs, which evolves over time. As they meet each other again and again, for example at the dog park, they develop a pattern of interaction where one dog is more assertive, and the other is happier yielding to their bossier playmate. This means that if dogs are well socialized, and allowed to work out their own relationships, dog fights and aggressive behaviours are very unlikely. The American Veterinary Society of Animal behaviour has released a policy statement which states that the concept of a dominance-based, alpha dog hierarchy is wrong, and should not be a basis for our interaction with our canine companions. Their sentiment is echoed by a wide variety of other dog training organisations in the UK. Read More: The Canine Dominance Myth EXPOSED! this is a pile of nonsense. clearly the person who wrote this has no idea about this technique. It is not only about punishment, it’s just one of the things you can do if needed. It’s about Exercise, discipline THEN affection. Walking your dog and exercising with them is always the main point of it. Two things. Perhaps the “alpha dog” concept as in, outside dog, isn’t true in the wild, but this article clearly states the “parents” of wolves are in fact the leaders and in charge of the pack until they can grow up and move away. So there IS an “alpha dog” or dogs, it’s the parents, which is the role we should assume with dogs until they die. Same thing, different name. So really this is saying the parents are the pack leaders, not that there is no pack leader. The second thing mentioned is that wolves aren’t naturally kept in captivity with other wolves. Yeah, neither are dogs normally. And the problem in the case of dogs is that they don’t move away when they grow up either. So yes we do have to look at what happens when they are grown up and can’t move away, just like those wolves in captivity, because this is what happens with domesticated dogs. We don’t let our dogs go wild into the streets when they turn 1-2 so they can move away, mate and start families on their own. But we do take them to dog parks, and they DO live with their “parent alpha” until they die, both things are unnatural, so once again, we do have to see how they behave in this captivity or domesticated state and take note on how to handle it better because this is in fact how dogs live with us in reality, just like those wolves in captivity. And sometimes they do have to live with dogs from outside their families. Really this article doesn’t debunk much other than, “they are using the wrong terminology”, but the concept, even according to this very article, appears to me is still very much true. And the reason why “alpha parents” never have to resort to dominating behavior, is because they never allow their children to misbehave or rebel against them in the first place. And this is not what happens when dog owners don’t raise puppies properly. They do often raise them wrong and often time from the age of 8 weeks. Most owners DON’T continue what the dog parent did to the puppy during the first 8 weeks. So then you better have a solution, if you want to figure out how to fix these behavioral problems later.